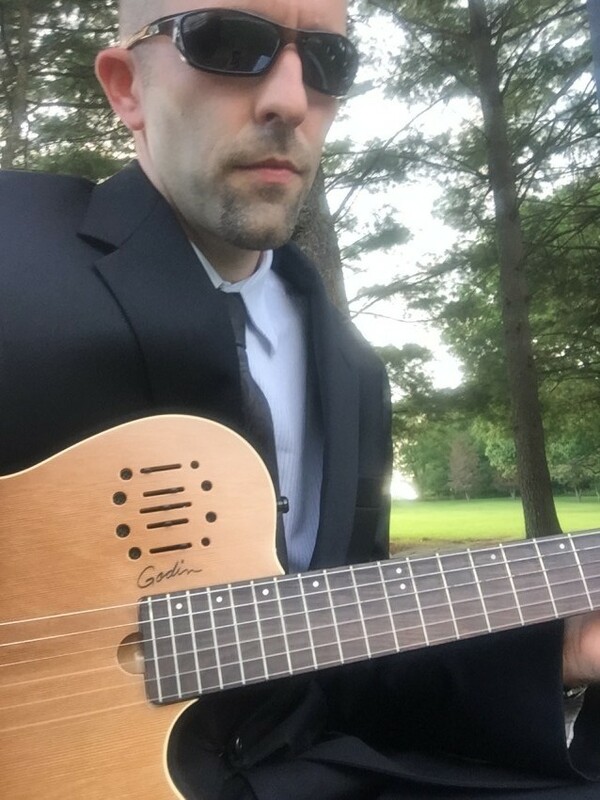 Kevin Shannon is a classically trained guitarist from the esteemed Peabody Conservatory. He has performed all types of venues for the past 10 years. He performs a wide range of musical styles, from classical, to Jazz, and even arrangements of popular music, all on a nylon classical guitar. He has state of the art sound equipment that allows him to perform in any venue, regardless of the size. He is professional in all facets of his business, from his attire, to his punctuality. He is very easy to talk to and communicate with. If hired, he will consult with you closely to create a playlist unique and personal to your event. We used Kevin for my step-daughter's wedding in MD. He was easy to communicate with, was right on time and even supplied wireless mics for the outside ceremony. Our venue was a bit difficult and required him to be in one location for the ceremony and another for cocktails but he handled it well and everything went smoothly. If needed we would use him again. Kevin provides an elite level of performance, that he has spent years crafting both in the world renowned Peabody Conservatory, followed by a decade of performance experience. Kevin has performed in a wide variety of venues, from private backyard parties, to the Kennedy Center for the performing arts. He uses his experience in multiple musical styles to create a playlist of hundreds of songs, from every possible genre. His guitar playing transcends style and genre to create and fill his venues with an expressive art that reaches all ages and tastes. He provides the highest level of client service. He is very personable, and easy to communicate with. Kevin is very willing to work closely to his clients and give them exactly what they are looking for. Kevin Shannon actively performs solo and chamber music on both modern classical guitar, and various period instruments including Lute, Baroque guitar and percussion. Kevin is a founding and current member of the Atlantic Guitar Quartet, a chamber ensemble dedicated to performing the music of living composers. AGQ has performed all over the east coast, and has won numerous awards, including the Presser award, and the Baltimore Classical Guitar Society's Composition Commission award. They've premiered and recorded music from some of today's most exciting composers such as Ronald Pearl, Christopher Gainey, David Smooke, Joshua Bornfield, Lewis Krauthamer, and Olivier Bensa. They continue to expand the repertoire of guitar music and perform at The Engineers Club of the Garret-Jacobs Mansion, where they are artists-in-residence. In the genre of early music, Kevin is a multi-instrumentalist that has performed with such groups as the Peabody Consort, the Peabody Renaissance Ensemble, Divisio, Heavens Noyse, and the Byrd Consort. He specializes in Medieval and Renaissance improvisation and performance practice, and is featured in multiple recordings. He received Bachelors Degree in Music Performance and Music Theory from West Chester University. He went on to receive a Masters of Music and Graduate Performance Diploma from the esteemed Peabody Institute, where he served as graduate assistant, and received numerous scholarships and grants. Recent notable performances include collaborations with the New York Baroque Dance Company, performances through the Midori and Friends Foundation, Goucher College, York College, Salisbury University's "Guitar in the Gallery" series, Harford College, Oldfields School, performances in the Marlow Guitar series, the Baltimore Classical Guitar Society, New York's Spring Stage music series, the Loyola College Concert Series, and performances at the Kennedy Center for the performing arts. He resides in Columbia, MD, with his wife and two children. Along with his performance schedule, Kevin maintains a private teaching studio, serving guitarists in the Baltimore/Washington D.C. area. Kevin performs on a nylon string classical guitar that is fitted with a built in microphone. Kevin runs this through a state of the art sound system, giving him the ability to perform for audiences from 25 to 250 people.